The Best Africa Travel blogs from thousands of top Africa Travel blogs in our index using search and social metrics. Data will be refreshed once a week. 2.15 The Africa Adventure Company: Luxury African Safaris. Africa Travel newsletter is a comprehensive summary of the day's most important blog posts and news articles from the best Africa Travel websites on the web, and delivered to your email inbox each morning. To subscribe, simply provide us with your email address. Africa About Blog AllAfrica Global Media is a multi-media content service provider, systems technology developer and the largest electronic distributor of African news and information worldwide. Get news on Travel and Tourism. Facebook fans 256,760. Twitter followers 300,482. Southern Africa About Blog Southern Africa's best known travel brand, Getaway encompasses a print magazine, tour & accommodation booking, beautiful photography, shows & events. The best travel stories, holiday ideas, recommendations, accommodation reviews, news and opinions from the Getaway Travel Magazine. Facebook fans 144,600. Twitter followers 390,196. Africa About Blog Welcome to the official Travel blog of Jovago.com. Africa's number one online travel agency. Learn tips and travel tricks about some of the top destinations in Africa and from around the world ! Facebook fans 531,671. Twitter followers 1,306. South Africa About Blog South Africa's premier Accommodation and Travel website offering a wealth of information and resources for the traveller to South Africa. Whether you're in South Africa on safari or to enjoy the beaches, breathtaking drives, or unspoiled wilderness, SA-Venues.com strives to help you experience the very best that South Africa has to offer. Facebook fans 36,126. Twitter followers 11,456. South Africa About Blog Stories and Info Guides from Africa's Leading Safari Company. It’s great to have you here. If you're as wild about African travel as we are, you’ve come to the right place. Our writers travel all over this captivating continent to bring back the best travel stories, advice and guides. So settle in and enjoy the journey. Facebook fans 182,104. Twitter followers 12,884. San Jose, CA About Blog The Amateur Traveler is an online travel show that focuses primarily on travel destinations and the best places to travel to. Get Africa travel information. Guide to Africa travel destinations, planning, and vacations. Photographs, videos, podcasts and articles about Africa. The Amateur Traveler podcast and blog are the creation of Chris Christensen. Facebook fans 4,905. Twitter followers 11,684. United States About Blog We are Natasha and Cameron of The World Pursuit. A travel website dedicated to helping you discover amazing destinations. We started traveling together over four years ago, and since then have visited over 60 countries across six continents. We started working on our blog two years ago to document our travels and get out more practical information to the public. Facebook fans 76,464. Twitter followers 14,019. Kenya, Tanzania & Zanzibar About Blog Asilia Africa is a pioneering travel company that runs 20 luxury camps and lodges in Africa's most important wilderness areas. We invite you to share our personal and unique take on the world's most beautiful natural areas. In our safaris and properties, we endeavour to deliver a sense of freedom and inspiration rarely found when travelling. Facebook fans 53,412. Twitter followers 5,571. Cape Town, South Africa About Blog Jenman African Safaris is a leading safari travel operator, offering tailor-made travel to all destinations in Southern Africa, East Africa and Madagascar. We know however that comfort is important to you, so we'll give you the best African Adventure, making sure you have comfortable places to sleep, good food and our Safari vehicles are tailor made so that you enjoy the drive. Facebook fans 17,615. Twitter followers 5,003. Cape Town About Blog Welcome to ExpatCapeTown.com, the only independent expat and travel guide to South Africa's most popular tourist destination! Our expat guide shares useful tips and insights and prepares you for your time in Cape Town and will be an invaluable tool for all who want to settle in more easily and successfully in South Africa. Facebook fans 994. Twitter followers 829. Mountain View, CA About Blog Comprehensive up-to-date coverage for africa travel, aggregated from news sources all over the world by Google News. Facebook fans 22,613,261. Twitter followers 212,950. Facebook fans 3,869. Twitter followers 5,391. London, Cape Town, Africa About Blog Acacia Africa are the adventure tours experts specialising in overland African travel, small group treks, African Safaris, Voluntours, single adventures and day trips for the adventurous. We offer a comprehensive selection of adventure holidays, overland safaris, tented and lodge safaris, carefully chosen for their value-for-money, enjoyment factor and intriguing itineraries. Facebook fans 10,813. Twitter followers 5,671. 15. The Africa Adventure Company: Luxury African Safaris. About Blog The Africa Adventure Company, is an award-winning travel outfitter and leading Africa specialist known for its extensive portfolio of more than 75 safari trips to over 14 African countries. Experience the best in African safaris. We have specialized in wildlife adventure & luxury safari trips for 30 years. Read our news & reports & keep updated with the latest in African safari travel experiences. Facebook fans 5,482. Twitter followers 539. Uganda About Blog African adventures, birding, conservation, culture, East Africa, expat advice, wildlife, volunteering, travel, Uganda. Read Diary of a Muzungu Uganda travel blog for adventure, conservation, culture, gorilla trekking Safaris, wildlife and birds, expat advice, East Africa. Facebook fans 5,707. Twitter followers 3,159. London About Blog Africa Odyssey are proud to offer the finest African safari experiences, tours, holidays and honeymoons. Mission to arrange the very best safaris for our clients. Facebook fans 1,449. Twitter followers 613. Bulawayo, Zimbabwe About Blog Welcome to African Bush Camps, a private owner-run African-based safari company that speaks of the art of service and offers you an authentic African safari in untamed wilderness. Our passion is to explore the wildest and most remote parts of Africa, away from the crowds or influence of today’s civilisation. Facebook fans 45,514. Twitter followers 2,057. Oxfordshire About Blog We launched Travel Africa magazine in September 1997 as a magazine for everyone with a love of the African continent and to help inspire and inform African travellers. We bring you our guide to everything you need to know about planning your trip to one of Africa’s finest wildlife reserves. Facebook fans 9,545. Twitter followers 8,416. Cape Town, South Africa About Blog Africa Addict is for everyone who loves stories about African travel, safari, adventure, heritage and people; for lovers of Africa to find and share content about the great diversity of travel and nature on this amazing continent. Travel blog about Africa, its people and places, safari and wildlife, adventure, heritage, road-tripping and slow travel. Facebook fans 626. Twitter followers 15,439.
new york, ny About Blog Former South African expat and avid travel blogger discovering what the world has to offer. My travel blog documenting my travels throughout the African continent and the world, along with plenty of travel advice to hopefully inspire. Blog by Johnny Chen. Facebook fans 2,237. Twitter followers 997. Africa & North America About Blog The world’s premier travel industry trade association promoting tourism to Africa. The Africa Travel Association (ATA) was established as an international travel industry trade association in 1975. ATA’s mission is to promote travel, tourism and transport to and within Africa, and to strengthen intra-Africa partnerships. Facebook fans 7,510. Twitter followers 2,349. Issaquah WA About Blog We are safari consultants; travel agents who specialize in Africa – only Africa. Award winning African travel experts. 20 years experience. Travel tips, where to go, and the things you need to know to get the ultimate enjoyment from your African safari! Facebook fans 546. Twitter followers 25. Facebook fans 3,373. Twitter followers 11,248. Australia About Blog An Australian owned and operated company providing tailor-made tours and safaris to Southern and East Africa as well as Egypt and the Indian Ocean islands. We are here to help you design your perfect safari holiday. We are the African Holiday Experts! Facebook fans 1,836. Twitter followers 426. Rwanda/Germany About Blog Augustine Tours specializes in Africa private tours and small group travels to Burundi, Rwanda, Uganda, Tanzania, Kenya and Ethiopia. Facebook fans 4,864. Twitter followers 6,909. Mooresville, NC About Blog Sandy Salle is the CEO of Hills of Africa, a travel company specializing in creating customized luxurious Southern, Eastern, & Central African safari vacations. Live the Magic of Africa blog explores exciting African destinations, safari and tour tips, African travel trends and news. Facebook fans 3,583. Twitter followers 13,471. Africa About Blog Safari Junkie™ is dynamic niche travel blog focused solely on Africa. Our aim is to spread a passion for all types of travel to Africa, inspire and to encourage people to take first step into wonderful world of Africa. We can partner with you and help promote trips, tours, sights and African destinations that wouldn’t ordinarily be on average traveller’s radar. Facebook fans 3,827. Twitter followers 1,264. Cape Town About Blog Journey in Style is an African Online Travel Agent. We are the online specialists in tailor made safaris and holidays to sixteen African countries. Our latest African travel blog and travel news for Africa safaris and holidays. Facebook fans 1,393. Twitter followers 38. Milton, MA About Blog Planning a vacation in South Africa? South Africa Travel & Tours turns your dream vacation in Africa into a reality. Experts in arranging safaris and tours, we make sure you get the exact experience you want when visiting South Africa. Facebook fans 48. Twitter followers 49. Facebook fans 2,457. Twitter followers 1,788. About Blog At Viva Africa Tours, we know how to kindle your enthusiasm and make you have the greatest holiday in the land of Kilimanjaro, Zanzibar and the Serengeti. We look forward to show you the natural wonders Tanzania! Facebook fans 10,601. Twitter followers 12. Johannesburg, South Africa About Blog The Made In Africa group offers exceptional tours and safaris in Africa's most sought-after wilderness destinations: South Africa, Botswana, Namibia, Mozambique and Zambia. Our mission at Made In Africa is to offer extraordinary safari experiences in Africa's most exceptional and pristine wilderness destinations. True African wildlife experiences put together by a team of experts! Facebook fans 4,309. Twitter followers 596. South Africa and USA About Blog Iconic Africa creates exclusive luxury African safaris and adventure holidays for couples and families in southern and eastern Africa. Our gorgeous destinations are all handpicked and visited by Terri and John. Research where your African Travel could take you, with Stories & Advice from Travellers & Seasoned Professionals, helping you choose Your African Experience. Facebook fans 3,529. Twitter followers 552. Cape Town About Blog Our African travel blog features a smorgasbord collection of articles ranging from updates from the bush, safari stories, travel tips and advice, conservation matters, industry gossip and insightful news and reviews about travel in Southern and East Africa. With contributions by travel experts with a passion for Africa, you will be inspired, informed and prepared for your next African adventure. Facebook fans 75,057. Twitter followers 4,895. About Blog Hi, I am Claudi. On Claudi Nine is a travel blog. Journey with me as I encounter unfamiliar cultures, cuisines, traditions and more around the world. Experience unfamiliar cultures, traditions and the people that live in the countries I am travelling to. Come, follow me and I am going to lift you up on Claudi 9 as well. Facebook fans 806. Twitter followers 181. Cape Town About Blog We Are Africa's vision is to unlock Africa from these tired old tropes, projecting a more modern and dynamic image outwards and bringing a plethora of new business in. In cooperation with the continent's best travel brands, we are dedicated to telling the many stories of Africa's diverse countries and people. Facebook fans 6,281. Twitter followers 3,479. KZN Midlands About Blog Hi. I am Carmen. I live in the Midlands of KwaZulu-Natal in South Africa. This blog is a place where I revisit some of the amazing places and spaces I get to frequent. The idea of starting a blog occurred to me after some friends were visiting and wanted some help finding their way around our wonderful Midlands Meander arts, crafts and eateries and had no idea where to go. So I decided to put some thoughts down both for the Meander and wherever I may end up visiting along. Facebook fans 782. Twitter followers 528. Nairobi, Kenya About Blog Kenyatalii.com has been providing information about various locations in Kenya where travelers locally and abroad can visit. Our main focus is Budget Travel across Kenya. Facebook fans 853. Twitter followers 2,558. Kenya About Blog This Kenya Travel Blog is aimed at giving you the current travel tips and advise as you prepare your African trip. Follow us for updated travel news including our guides. Facebook fans 3,079. Twitter followers 1,980. About Blog Cape Town's Best Travel Desk for Daytours, Garden Route and Overland Trips in South Africa. Visit the Winelands or go on a Safari. Book online now ! Facebook fans 1,740. Twitter followers 510. About Blog African Travel Market is a new glossy travel, trade and business publication that dares to reposition the African continent as a destination of choice. The trailblazing magazine features a strong lifestyle element and is available in both traditional (print) and digital (embracing new media and social media) platforms. Facebook fans 3,816. Twitter followers 2,280. South Africa About Blog A South African travel blog that shares the untold stories of local towns, tips and tricks for traveling on a budget and life of the average traveler. Facebook fans 1,530. Twitter followers 1,349. Durban About Blog Wild at heart African travel tales and laid back adventures. Blog by Kelly Robertson. Cape Town, South Africa About Blog Ker & Downey is a destination based African Adventure Travel Specialist steeped in history. Mission to illuminate the wonder and diversity of the African continent, to stimulate the imagination of those who travel here and for Africa to inspire, the way it inspires us. The Ker & Downey Insider Blog focuses on news and views surrounding our experiences, as well as tips and trends. Facebook fans 5,019. Twitter followers 1,592. Dubai/South Africa About Blog Discover all you need to know about Eco-friendly Africa Travel. Learn how to preserve Africa's natural beauty with our guide to sustainable eco-tourism. Mission is to bring you informed, well-researched articles about the environment and what we can do to conserve it through sustainable eco-travel, and to introduce you to amazingly inspirational eco-pioneers who are changing the world every day! Facebook fans 1,497. Twitter followers 359. South Africa About Blog We are a family who loves to learn through travel. We plan to home school our kids, sell the house and travel South Africa. Facebook fans 327. Twitter followers 2,315. South Africa About Blog Africa Travel Channel showcases Africa to prospective tourists and investors. Places to stay, things to do and investment opportunities in property and infrastructure, all form a part of this channel. Follow us to keep up with the latest updates. Liverpool (and Africa) About Blog Helen in Wonderlust: Inspirational stories, travel tips and motivation for female adventure travel around the world. Adventures in Africa and around the world! Head over to my blog for all of my travel tips and stories. I run tours to Africa too - you should come! By Helen Davies. Facebook fans 3,035. Twitter followers 3,230. About Blog Follow Noel & Marilu as they travel through Africa in a trusted Land Rover Defender named Maggie. Facebook fans 301. Twitter followers 201. Cape Town, South Africa About Blog Africa Travel Co is one of the BEST established Overland Safari companies in Africa and is completely African based. This is a series of posts on reasons to choose Africa Travel Co for your overland safari trip or tailor-made group tours. Facebook fans 20,053. Twitter followers 4,429. Southern & East Africa About Blog Cedarberg Africa is a family-run business operating from the UK and South Africa. For 17 years we've been helping families, groups and individuals who want a high value, tailormade safari in Africa. Facebook fans 3,788. Twitter followers 4,209. About Blog Backpacking Africa is not too scary, not too hard, not too dangerous. Backpacking to Africa should be your new backpacking route & you need to start here!! Follow us for awesome tips, ticks, & inspiration for travel on the continent. Facebook fans 1,002. Twitter followers 228. Johannesburg, South Africa About Blog I’m Meruschka a.k.a Mzansigirl – African travel activist, experience seeker, and tourism thinker. I’m a passionate South African and obsessed with sharing everything awesome about my country and continent particularly anything related to travel or culture. Facebook fans 3,751. Twitter followers 20,646. About Blog IndiKate is an independent travel blog that covers adventures and everything linked to them from eating out and great wines, to art and things to do. Posts cover a range of destinations, mostly from South Africa but slowly extending to the rest of the world. IndiKate always provides the best travel tour package mostly from South Africa but slowly extending to the rest of the world. Facebook fans 3,217. Twitter followers 5,027. Tanzania About Blog Moonlight Tours Expedition was founded by Fredrick Saturun is passionate about the captivating spirit of his native Tanzania; its flora and fauna especially, and seeks to share and instill this within everyone who treks or travel with his company. Facebook fans 621. Twitter followers 473. About Blog Travel tips about tanzanite, Trekking Kilimanjaro,gemstones, adventures,Tanzania Travel tips,wildlife safaris, house rent Tanzania, Tanzania safari bookings, cheap hotels, African safaris,vacation holidays lodges,southern circuit safaris, coffee tours, cheap flight ticket,budget travel,car hire is here. Morogoro About Blog Everyone enjoys the tourism in Tanzania. But it can be hard work to make great vacation if you do not know who truly specializes in your tour. At Safaris Partners, We carefully take you to all parts of tanzania and make your safari memorable. Facebook fans 2,567. Twitter followers 6. 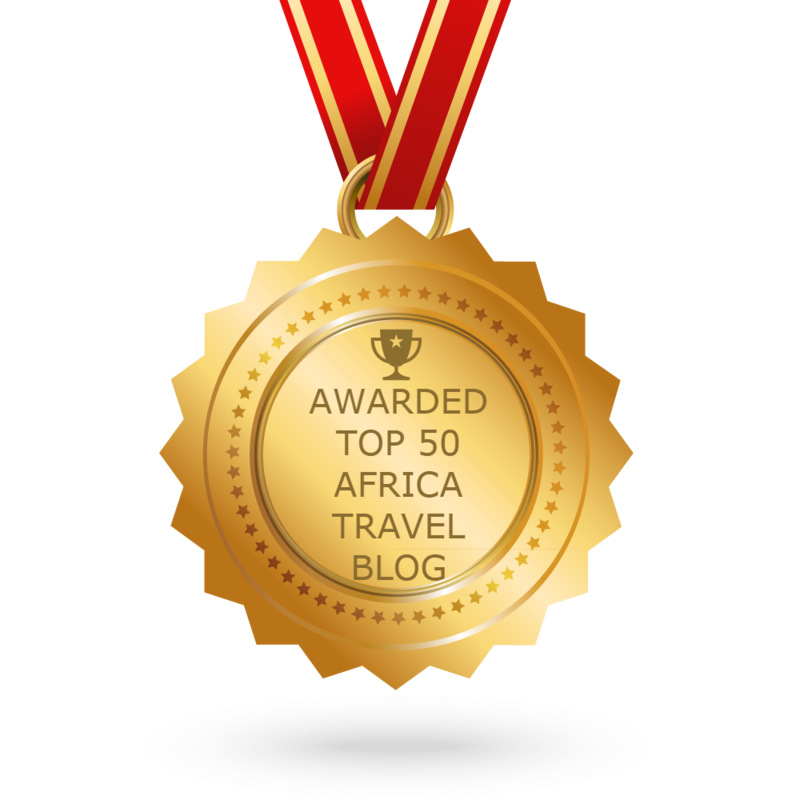 CONGRATULATIONS to every blogger that has made this Top Africa Travel Blogs list! This is the most comprehensive list of best Africa Travel blogs on the internet and I’m honoured to have you as part of this! I personally give you a high-five and want to thank you for your contribution to this world.